TPWD reports a ship sinking in the Gulf of Mexico, off shore from Mustang Island, but everything is good. The 155-foot Kinta S slipped to her watery grave Wednesday in the Gulf of Mexico. The nearly 40-year-old freighter will foster new marine life for years to come. Scuttled in 75 feet of water eight miles out into the Gulf as part of Texas Parks and Wildlife Department’s artificial reef program, the Kinta S is the largest ship to be reefed since the 473-foot Texas Clipper was sunk 17 miles off South Padre Island in 2006. Launched in Japan in 1976, the formerly Panama-flagged Kinta S will enhance an existing site known as the Corpus Christi Nearshore Reef. The 169-acre reef, composed of 470 concrete pyramids and several thousand tons of concrete culverts, was begun in the fall of 2013. Officially it is known as MU 775. “The Kinta S was just a rusty, outdated cargo vessel with no historical significance, but now she will live on as underwater habitat for marine life and an interesting destination for scuba divers,” said Dale Shively, director of the TPWD artificial reef program. Since it began in 1990, the Texas artificial reef program has grown into one of the largest such efforts in the nation, with 68 reef sites in the Gulf of Mexico ranging from 40-to-360 acres in extent. The majority of the reefs are in federal water, which begins nine miles off the Texas coast. Some are up to 100 miles from shore, deepwater habitat for popular species like red snapper. The Kinta S, which once plied the Caribbean, was salvaged in Miami in June and towed to Orange Beach, Ala. where the Walter Marine Co. readied the ship for its voyage to Texas. That process included cleaning it and cutting holes in the hull and then fitting them with marine plywood covers that when removed would cause the ship to take on water. Facing backward, the Kinta S was pushed to Port Aransas by the Walter Marine tugboat, Maranatha. The vessel left Alabama on Sept. 10 and arrived in Texas ahead of schedule last weekend. Sinking the vessel had to be delayed until Wednesday due to rough seas. TPWD’s artificial reef program repurposes three types of materials: decommissioned drilling rigs in the Rigs-to-Reefs Program, highway bridge materials and other types of concrete and heavy-gauge steel in the Nearshore Reefing Program, and large marine vessels in the Ships-to-Reefs Program. In waters ranging from 50 to over 300 feet deep, petroleum production platforms (jackets), scrapped concrete culverts, barges and a variety of decommissioned water craft (including the Texas Clipper) become undersea oases for a wide range of marine species. The importance of the TPWD reefing program has to do with the undersea geography of the Gulf of Mexico. While its water supports thousands of different plants and marine life species that for part of their life cycle need to be attached to a hard surface, the bottom of the Gulf is mostly barren. Man-made structures like artificial reefs provide invertebrates like barnacles, corals, and sponges the hard surfaces they need to thrive. Those species constitute the lower rung of the Gulf’s food chain, providing nutrients for snapper, grouper, mackerel, shark and other fish species. In addition to improving fishing opportunities in the Gulf, the Corpus Christi reef is one of eight such sites within nine nautical miles of shore that offers diving opportunities, with more nearshore reefs being planned. The most accessible sites are six to 30 miles from major Gulf ports. Texas’s artificial reef program is funded through donations from private and corporate partnerships and government grants, not from general tax revenue. 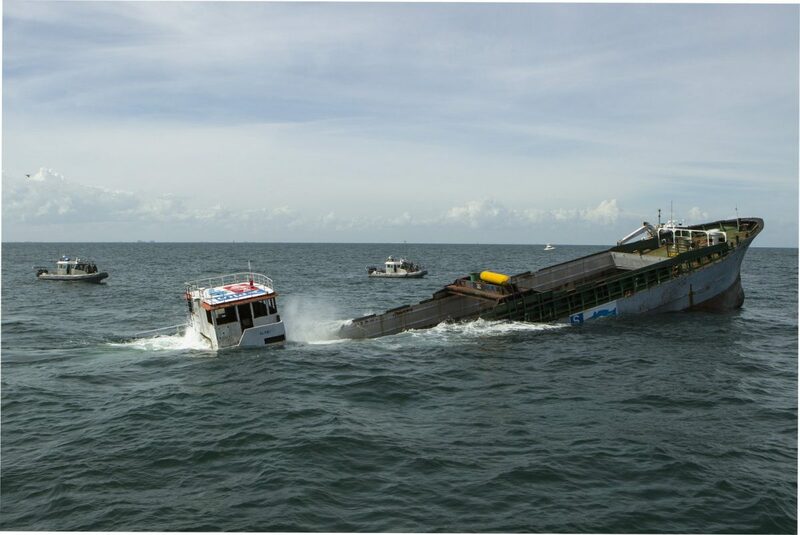 SEA contributed $100,000 toward the preparation, towing and sinking of the Kinta S.
Photo: Flanked by Texas Game Warden boats, the 155-foot Kinta S sinks in 75 feet of water in the Gulf of Mexico near Corpus Christi Wednesday, September 17, 2014. The ship was scuttled to create a new artificial reef that will provide habitat for saltwater fish as well as a destination for underwater divers.